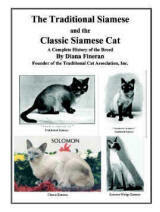 Cat Breeds Recognized by the Traditional Cat Association, Inc. Anyone interested in creating support for additional breeds not yet accepted by TCA, Inc. can easily request acceptance of that breed. You will find us friendly, helpful, and open minded. Only healthy, long-lived breeds with no lethal genes will be considered. The steps to get accepted are very straight forward. For instructions, please write to our secretary for assistance. The breeds that are currently accepted by TCA, Inc. are listed below. If a link appears, then you will be taken to the TCA FAQ for that breed. Please contact Diana@traditionalcats.com for further information. Diana Fineran holds Federal Copyright to all but 2 of the TCA, Inc. Breed Standards. Diana has written over 70 Breed Standards for the exclusive use of TCA, INC. ONLY.